We’re crazy for this wine cellar’s incredible cascading shelves. As well as adding tons of storage space, the shelves give the room a focal point and an opulent feel. This wine cellar is gorgeous in every way, but what inspires us most design-wise is the contrast between the floor’s chunky stone flooring and the ceilings more elegant brickwork. The unique mix brings tons of texture and interest to the space. We love this super-modern take on a wine cellar. 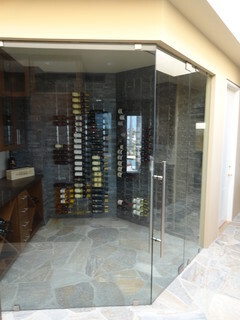 Glass doors highlight the beautiful bottles rather than hiding them away, and the clean lines of the design make the cellar fit effortlessly into the room. 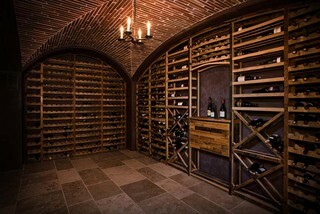 If you have big wine cellar dreams but a small amount of space to work with, take inspiration from this photo. 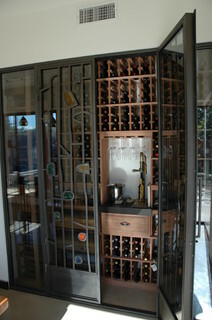 Builders transformed a small breakfast nook in a beach house into a spacious wine cellar. Those beautiful glass-and-wrought-iron doors add a unique touch. 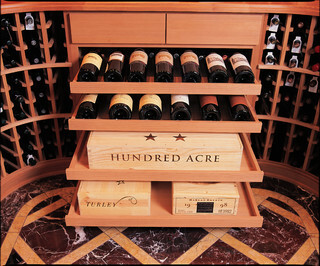 We love the lower drawers in this cellar designed to hold wine crates. Besides adding interest by visually breaking up the rows of racks, this design idea offers a great place to store those cases you picked up from your last Napa trip, giving your wine cellar a personal touch. 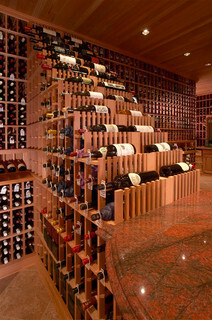 How big is the Huntington Beach wine cellar?